We received some oyster mushroom growing kits from Back To The Root at the beginning of the year. Initially, we ran into some issues getting the mushrooms to grow. The first problem was because we had placed the kit in the office so we could watch it grow. While one of the boxes had something growing after a week, something in the office was not to the mycelium’s liking. The growth stopped after a few days. Then absolutely nothing happened for the next few weeks regardless of our efforts (soaking the bricks, misting them every day, etc). We finally decided to look for a more agreeable environment and start over. Our guess was that the office on the second floor was too warm and dry. So we moved everything down to the basement where the temperature was a constant and cooler 55º. Sure enough, with in a week, we had a bunch of little mushroom caps popping out everywhere! Once they got their little mushroom engines going, they grew quickly. On some days, they would look different between morning and night. It took about a few weeks for the mushrooms to peak. First Harvest (March): After about ten more days, it was clear that the growth had stopped. The mushrooms were still quite firm, but some had started to fade. Being our first successful batch, we decided to be conservative and harvested them before they wilted any further. From the two bricks, we got close to a pound of mushrooms. We made a dish using one of the recipes from BackToTheRoots. The mushrooms had very nice texture, were tasty, but the flavor was quite subtle. 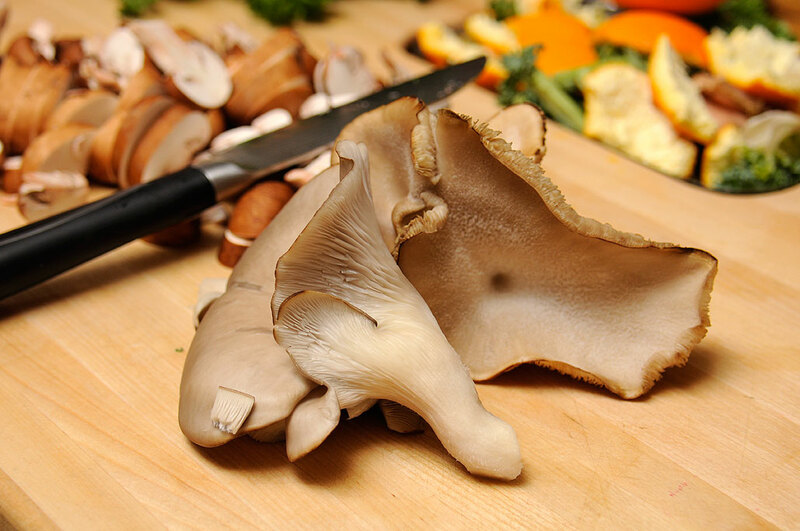 We wanted to be able to taste more of the mushroom so next time we will just saute them in some garlic and olive oil. Second Harvest (April): After harvesting the crop, we left the bricks in the basement to see if we could coax another crop out of them, but got sidetracked and forgot about them. A few weeks later, we noticed little caps had started to poke out in both bricks, all without us doing anything. So we began the regular misting regiment again. This time only one of the two bricks took off. The other brick started to fade and eventually dried out. We were not really sure what happened as both were growing under the same exact conditions. The interesting thing about this second crop was it looked nothing like the first. There were only two caps, but they got huge and came in close to half a pound. Not bad considering that we didn’t really have to do much of anything except to mist it and watch it grow. Outside (June): We wanted to see if we could get one more crop out of the bricks, but this time mold took over (we may have been eager misters). So we took the mycelium out of the plastic, washed the mold off the bricks, and buried them in a shady wet spot in the RainyDayGarden. A month goes by and nothing happened, so we thought that was the end of it. However, when we went looking for moss for our desktop terrariums, much to our surprise we found two large caps growing out of the ground! We chose not to eat these because we weren’t rock sure that that particular spot in the garden was chemical free. And we also didn’t want to challenge the mushroom gods; just because they looked like oyster mushrooms didn’t mean they were oyster mushrooms (again, it was a soil issue). 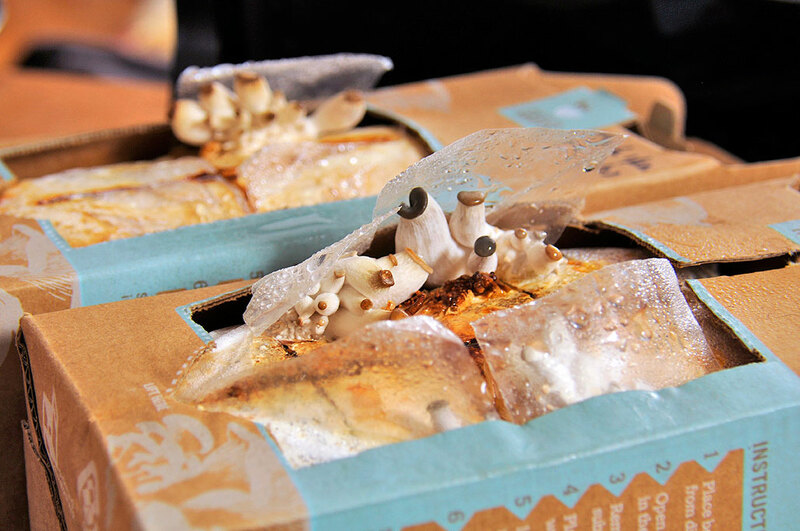 The Back To The Roots oyster mushroom kit is a really great gift idea. It comes complete and ready to go. Once they get started, they are a whole lot of fun for everyone. After the excitment of watching the mushrooms grow, they will make a tasty treat. What’s not to love??? Do keep in mind that, depending on the time of the year, the mushrooms may be a little tricky to get going. The great thing about mushrooms, however, is that just because they aren’t growing doesn’t mean they are dead. They will stay dormant until the conditions are right. 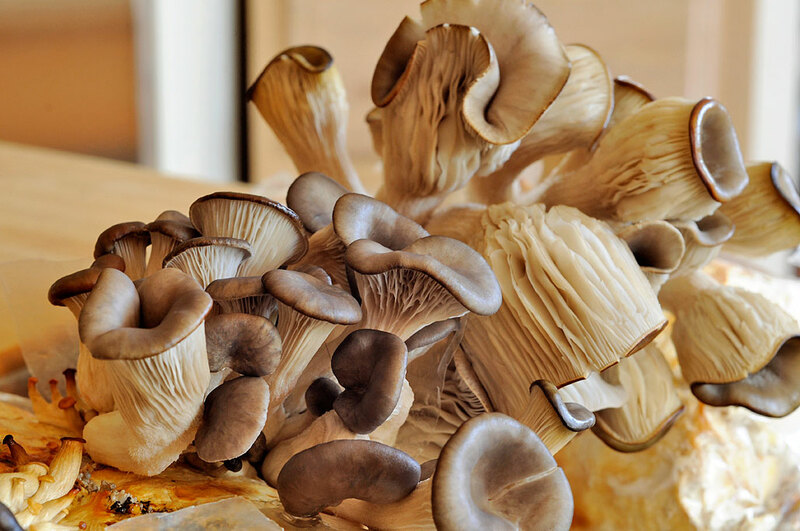 Get a kit from the Back To The Roots folks and find out how amazing it is to grow oyster mushrooms right in your own home! UPDATE (June 28, 2013): It appears that we may have inadvertently started an oyster mushroom patch in the RainyDayGarden. The few buried bricks of coffee grounds have not decompose, but have continued to produce mushrooms.